This 19 day small group tour of Peru includes a four day trek on the Inca Trail to Machu Picchu from Cuzco and the Urubamba Valley. However, there's so much to get excited about pre and post trek. Starting out in the capital of Peru, Lima, you'll travel south to the animal abundant Paracas National Reserve where a birdwatching and marine wildlife boat ride takes you around the absolutely beautiful Ballestas Islands. This is a fantastic opportunity to see some of South America's indigenous species in one of the most important marine sanctuaries on the planet. Next stop is an altogether drier destination as you journey inland towards the Ica Desert in search of some of Peru's best-loved wines at the Tacama winery. An exciting dune buggy ride and a night under the desert stars always make the oasis village of Huacachina a memorable highlight before you set off the following morning en-route to the Nazca Lines and the mummies of Chauchilla Cemetery. After bidding farewell to the Atacama Desert you'll ascend into the Andes Mountains and the stunning Colca Canyon for four days of optional outdoor activities. This section of the tour can be as fast-paced or as relaxed as you wish with lots of opportunities to hang out with new friends or just sit and stare at the mountain peaks prior to preparing for Cuzco and the start of the Inca Trail. An early start signals one of South America's most fabled trails is just moments away. For the next four days you'll follow the legendary Inca Trail to Machu Picchu accompanied by guides and porters. This is an absolutely unforgettable highlight of this 19 day tour and features some stunning valley views from sections of the trail that are located at an altitude of over 12,000ft. After spending time at Machu Picchu you'll ride the rails down into the valley and back to Cuzco from where you'll have two whole days free to recover and take in the sights. 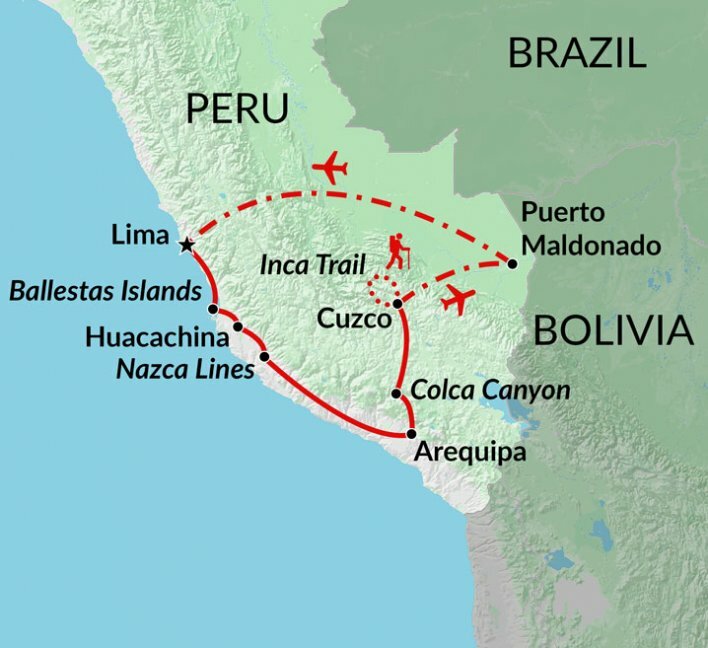 Once you're fully rested you'll take a short flight from Cuzco to Puerto Maldonado and head for three nights in the jungle. Tambopata National Reserve makes the come down from Machu Picchu so much more bearable with a boat ride to a jungle lodge ensuring your exotic adventure begins as it means to go on. Guided nature walks allow you to find out more about Peru's indigenous plants and animals as well as providing untold organic encounters to set your senses buzzing into overdrive. Exploring the rivers of Tambopata National Reserve by canoe allows you to experience the wildlife from a whole new angle with giant otters, monkeys, caimans and a huge variety of exotic birds adding to the thrill of being completely immersed in a South American jungle. Unfortunately, all good things have to come to an end and after your final day of optional jungle activities and your last night at the lodge you'll head back to Puerto Maldonado and your return flight to Lima from where you'll depart for home. We believe that in order to achieve any objective, the company has to have accurate policies and procedures for the employees and the guests to follow in order to reach our goal. In Peru, we encourage our travelers to not contribute to the already excessive rubbish that floods the cities. We brief them on the best means of disposing of empty water bottles and food wrappers. We have decided that the environment is a major component of any local community and any negative effect on the environment would directly have an impact on the lives of the inhabitants of the local community. Therefore, we have drawn up a strict environmental protection policy that all our employees and travelers have to abide by. For example, we recycle empty ink cartridges. A company collects them and disposes of them in the correct manner. Deforestation, pollution and endangered species are the most important environmental issues that Peru faces. Our travellers are encouraged not to smoke in forests, as well as stay in the walking trails at all times. We warn them of the dangers of forest fires if they were to expose of cigarette buds in a careless manner. While in the forests, they should never pick any flowers or attempt to kill bugs. These may be on the list of endangered species. Water Pollution is one of the major concerns that the Peru environment faces. It is just a small act from a traveler to refrain from throwing any waste into the streams and rivers. The same goes for dumping waste in the forests that are traveled through and camped in by our tours. We believe that the Responsible Travel concept has to be a two-way strategy with both our travelers and the local community gaining benefits. We benefit the local communities we visit using a wide scope of activities that have a positive impact directly by donating money to charity organizations, financially supporting some local communities and by recruiting employees who belong to the local community. We encourage our guests to buy local products and make use of services that people in local communities offer. We educate all our staff on the real life situations in Peru. Sales consultants will use this information to inform potential travelers of the correct information and dangers that they may face. By creating long lasting relationships with our local ground handlers, we are able to establish what needs the community has and through their information we can inform our travelers what they can contribute to the local community from their home countries. Poverty is one of the main problems in Peru. Children and women are affected as well as men. We are always searching for means by which we can find donation opportunities by which our travellers can donate knowing that the money will reach the right people. In Peru, travelers are encouraged not to tempt children or any locals with food and sweets. The culture has to be respected at all times.